Meanwhile, in wok or 10-inch skillet, heat 1 tablespoon of the oil over medium-high heat until hot. Add chicken strips; stir-fry 5 to 6 minutes or until no longer pink in center. Remove chicken from wok; place on plate. Add remaining 1 tablespoon oil to wok. Add asparagus and onion; stir-fry 3 minutes. Add mushrooms; stir-fry 3 minutes longer. Add water; cover and steam 2 to 3 minutes or until asparagus is tender. Meanwhile, in small bowl, mix stir-fry sauce and oyster sauce. Add sauce mixture and return chicken to wok; stir-fry about 1 minute longer or until hot. 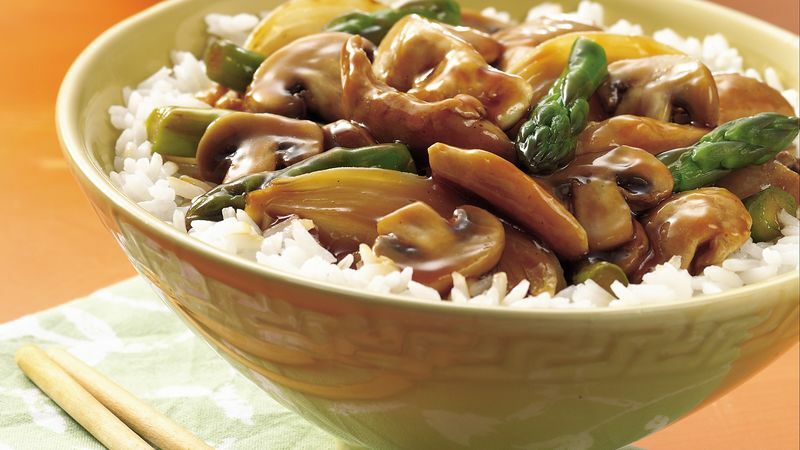 Oyster sauce is an Asian table condiment and stir-fry seasoning. Look for it in the Asian foods section of the grocery store, or take a trip to an Asian market. A variety of mushrooms adds depth to recipes. Try shiitakes and cremini in place of some of the white mushrooms.